Source: CICH graphic created from data adapted from Statistics Canada. Table 206-0011- Market income, government transfers, total income, income tax and after-tax income, by economic family type, Canada, provinces and selected census metropolitan areas (CMAs), annual. http://www5.statcan.gc.ca/cansim/a26?lang=eng&retrLang=eng&id=2060011&&pattern=&stByVal=1&p1=1&p2=31&tabMode=dataTable&csid= – accessed July 12, 2017. Between 2010 and 2014, Canadian couples with children saw their median after-tax income* increase by 6.6% to $91,000. 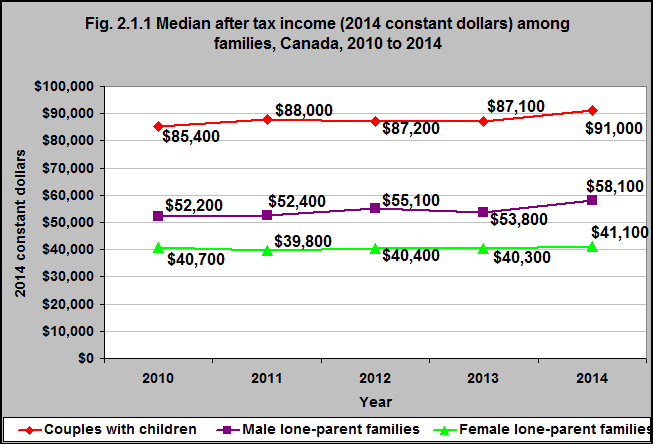 Male-led lone-parent families saw an increase in median after-tax income of 11.3% to $58,100. Female-led lone-parent families only saw a 1% increase in median after-tax income to $41,000. 1Campaign 2000. 2016 Report Card on Child and Family Poverty in Canada. http://campaign2000.ca/wp-content/uploads/2016/11/Campaign2000NationalReportCard2016Eng.pdf – accessed June 20, 2017. 2Anderson Moore K, Redd Z, Burkhauser M, Mbwana K, Collins A. Children in Poverty: Trends, Consequences and Policy options. Child Trends Research Brief. 2009. https://www.childtrends.org/wp-content/uploads/2013/11/2009-11ChildreninPoverty.pdf – accessed June 20, 2017.